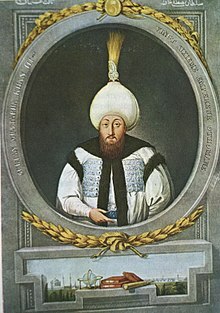 Mustafo III (Usmonli turk tilida:مصطفى ثالث|lit=Muṣṭafā-yi sālis) (28 Yanvar 1717 – 24 Dekabr 1773) Usmonlilar imperiyasining 1757-1773 yillardagi hukmdori. Ahmad IIIning o’g’li (1703–30) va Abdulhamid Ining (1774–89) ukasi. ↑ Hoiberg, Dale H., ed (2010). "Abdülaziz". Encyclopædia Britannica. I: A-ak Bayes (15th nashri). Chicago, IL: Encyclopædia Britannica Inc.. 21 b. ISBN 978-1-59339-837-8. ↑ Palmer, Alan (May 19, 2011). The Decline and Fall of the Ottoman Empire. Faber & Faber. ISBN 978-0-571-27908-1. ↑ Brill, E. J.. The Encyclopaedia of Islām: A Dictionary of the Geography, Ethnography and Biography of the Muhammadan Peoples, Volume 3, Part 2, 761. ↑ Faroqhi, Suraiya (November 29, 2005). Subjects of the Sultan: Culture and Daily Life in the Ottoman Empire. I. B. Tauris, 326. ISBN 978-1-850-43760-4. Bu sahifa oxirgi marta 5-Sentabr 2017, 11:21 da tahrir qilingan.